Event crowdfunding platform Live on Demand is on a roll: Just two months after bringing Eric Ries to the Netherlands, they hosted another Lean Startup expert session. 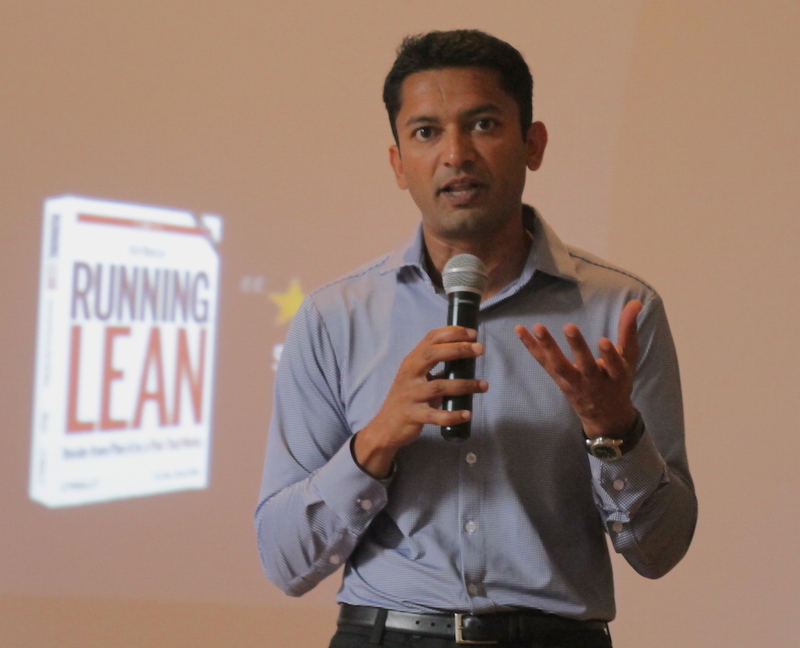 Author Ash Maurya of ‘Running Lean’ explained how to apply Lean in practice. Ash Maurya is a serial entrepreneur and author of the book ‘Running Lean’. Of all the lean startup book authors, one could argue that he is the most practical. Eric Ries’s boek (The Lean Startup) is the best in explaining why you should use Lean Startup. Ash’s book is the best book in explaining how to use this method. Ash Maurya wrote his book in a truly lean fashion: he first started blogging and giving talks, and only later created a full book. Ash’s book and his talks seem analytical. He doesn’t talk about finding co founders and building teams. Instead he focuses on value equations and measuring learning. He is an engineer and scientist, applying his analytical skills to help startups. Ash’s talk took place at Rockstart and was attended by about a hundred people from the Dutch startup scene. It was an unexpected but very welcome opportunity to meet Ash in person, organized by Rockstart participant LiveonDemand. LiveonDemand is ‘a crowdfunding platform for live performance’. Anyone can request a speaker or artist to perform in a certain city. If enough people pre-buy a ticket, LiveonDemand contacts the artists, makes arrangements and sells the remaining tickets. Part of the concept is that the earliest backers are rewared with a golden ticket: they get the best seats, extra goodies and often a meet and great with the speaker. LiveOnDemand started in 2013 and received seed funding in 2014. It initially had a slow start: it took them 1.5 years to get one of their first events organised (a talk by Eric Ries). Now however they seem on a roll: they raised additional funding via Leapfunder and made a great event out ot the Eric Ries talk together with Neelie Kroes and StartupDelta. Eric Ries clearly was impressed, since he became an investor in LiveOnDemand and is using the platform for additional European talks. “We are very lucky to be able to organise Ash’ talk at such short notice. He was already here for another meeting, so we seized the opportunity to organize this here with Rockstart”, said founder Thijs Sprangers. “Having Eric Ries on board is of course also very valuable. He knows all the Lean Startup thought leaders”. For defining progress, he asserts that some experts approaches take a too scientific approach to the Lean startup. They see all learning and gaining knowledge as progress, but loose sight of actually getting closer to being a business. Learning itself is not the ultimate goal, but having a successful business model is. Any team that cannot be fed from two pizza’s is probably too large. Ash gave an example of a practical model that he uses to define a business model: the customer factory. This factory takes unaware visitors as input, and should produce happy customers: it should create value for stakeholders in such a way that in the end certain people sign up and become paying customers. For each business model, you can write down the steps involved and measure the performance at each step, e.g. conversion from website visitor to leaving an email address, or from email address to becoming a trial user. This model then allows you to ‘see waste’. Waste is used here in the traditional lean manufacturing sense. A lean startup takes a lot of inspiration from the Toyota way and other Lean production examples. The value created for customers is higher than the amount the company receives from them (the ‘value captured’). The value captured is higher than the total cost of the startup. Ash stated that he prefers to focus on the value captured, as this is the variable in both equation. We asked him whether this isn’t an example of premature optimisation, as most startups fail already in the first step of creating value. Ash: “I would still recommend to focus on value capture. Take Facebook and Twitter as examples. Both companies create a lot of value, but Facebook is much better at capturing it. It therefore is the more valuable company”. His final recommendation was about focus. Entrepreneurs should focus on the step that is most constraining the business. His recommendation was to read the classical management book ‘The goal’ in order to understand the Theory of Constraints. This theory shows that each process must have a bottleneck, and that a process is only improved if you change the bottleneck. Applying this theory to the growth of a startup should help entrepreneurs find the bottleneck in their happy-customer process. Ash ended his talk with a remark on timing. In a recent TED talk, Bill Gross has noted that timing, not talent was the key factor in making a billion dollar company. Ash agrees with the research, but notes that even if timing is the key to success, Lean Startup is still a good idea. Lean startups allows you to more quickly find out if the timing is right for your startup idea. You learn this faster and save time and money by knowing quickly whether you should pivot or persevere. One of the questions from the audience was if and how Lean startup applies to larger companies. Ash definitely believes it does, but also thinks that large companies should keep their innovation projects human-sized. Ash quoted the two-pizza rule from Amazon: any team that cannot be fed from two pizza’s is probably too large. All in all it was an exciting and fast paced evening and another success for LiveonDemand in bringing a special guest live on stage. LiveOnDemand is already working on their next goal: to bring Elon Musk to The Netherlands. Let’s hope this campaign succeeds. You can also sign up for Eric Ries in Paris and Berlin.